In the last few days, the Federal Aviation Authority has taken the drastic step to stop people bringing the new Samsung Galaxy Note 7 onto planes for fear of them spontaneously combusting. This comes days apart from Quantus Airlines starting to warn passengers against charging or turning the devices on whilst on the plane, after cottoning on to stories of the phones ‘exploding’. This has caused Samsung to issue an embarrassing global recall of the handset to investigate further. The problem (as you might expect), lies with the battery. The image to the left shows the latest and possibly most famous incident of the 35 presently reported. 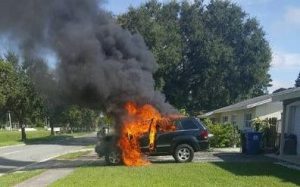 Nathan Dornarcher left his Note 7 on charge in his Jeep, only to return to to flames emitting from the phone which quickly consumed the whole vehicle. The Korean company have recalled all 2.5 million new Note 7 phones – 1.5 million from stores, whilst around 1 million are currently out in the public domain after already being sold. Samsung are working on a database where customers can enter their IMEI code to check if their device is affected or not. The database will be published later this week.